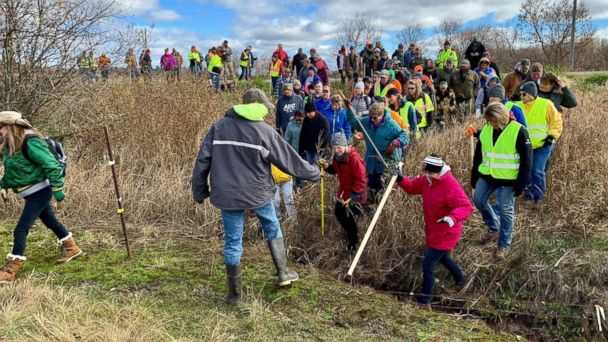 Two-thousand volunteers are combing several miles of rural Barron, Wisconsin, Tuesday in the hopes of finding clues in the case of missing 13-year-old Jayme Closs. As volunteers embarked on the ground search, they were told to keep their eyes open for anything that looked like it did not belong, like phones, weapons and clothing, said Barron County Sheriff Chris Fitzgerald. "I'm a dad. I'm a grandpa and this is the right thing to do today," volunteer Mike Buraglio told ABC News as he arrived at the search site. "I think everybody's very emotional about this," he added. "We all live in the same area, same community, and we all help each other." The 5-mile search area surrounds the home of Jayme's parents, Denise and James Closs, where the couple was found shot dead in the early hours of Oct. 15. Police responded to the house that morning after a strange 911 call. No one spoke on the call but a dispatcher could hear yelling, according to records. Jayme was believed to be home at the time of the killings but had been abducted by the time police arrived just minutes after the 911 call, according to authorities. Jayme is considered missing and endangered, the sheriff's department said. "It's important to show people, you know, hope, and that we all care," Josh Murphy, who volunteered to search the grounds Tuesday, told ABC News. "It's been chaos. A lot of people felt it. I can feel the pain of the family even though they're not part of my family. That's how I keep focused on showing hope." "The family needs answers. We need to find her, our winter is coming," added local resident Amy Hugh. "There's no words to describe how important it is." This call for help comes after an initial search by 100 volunteers on Thursday. It's not clear if any evidence was found in that search. Investigators believe Jayme is still alive, Fitzgerald told ABC News on Tuesday, and they won't stop until they bring her home. "The hope is what we're riding on," he said. On Monday, Fitzgerald said authorities are looking for two vehicles of interest after cars were spotted near the Closs home around the time of the crime. One car was likely a red or orange 2000 to 2014 Dodge Challenger, based on surveillance videos from homes and businesses. The second car was likely a 2006 to 2010 black Ford Edge or a 2004 to 2010 black Acura MDX, Fitzgerald said. Fitzgerald told ABC News Tuesday that investigators are following up on "a number" of tips in response to the vehicle descriptions. An Amber Alert has been issued for Jayme. Anyone with information is asked to call the 24-hour tip line at 855-744-3879. Meanwhile, a funeral for the missing girl's parents, Denise and James Closs, will be held Saturday.